Town of Deep River Lower TierRecord Owner? Log in. The Deep River townsite was selected in 1944 by the Canadian government as a community for the staff of the Chalk River Atomic Energy Plant then being built 9 km. downstream. When the post office was established in 1945, Defence Industries Limited, was designated the frrst postmaster. The name derived from riviere creuse, (deep river) which was how explorer Chevalier de Troyes described that stretch of the river in 1687. Near the townsite, parts of the river are over 240 feet (75 m) deep. 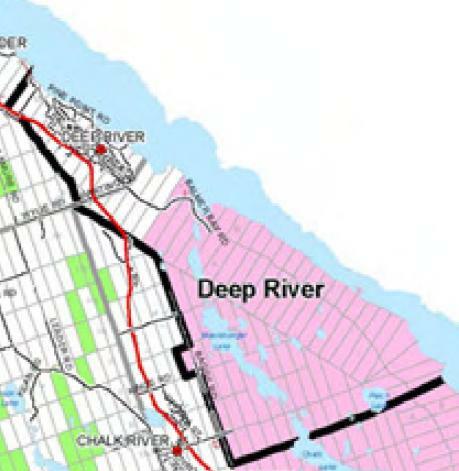 Deep River operated as a company town until 1956 when it was incorporated as a municipality. Have something to say about Town of Deep River Lower Tier?